NEW YORK, March 1, 2017 /PRNewswire/ -- The Impossible Burger will debut tomorrow at the flagship outlet of the award-winning restaurant chain Bareburger. 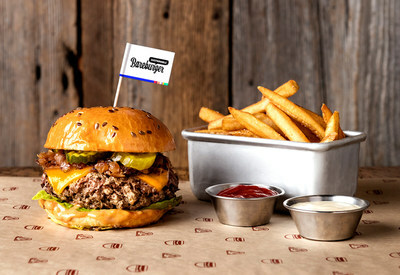 Initially, Bareburger (www.bareburger.com) will serve the plant-based burger exclusively at its outlet near New York University's campus (535 LaGuardia Place, New York, NY 10012). More Bareburger outlets are expected to add Impossible Burger to their menus as Impossible Foods increases production. Chef Jonathan Lemon serves a Bareburger Impossible Burger, which comes with signature seasoning, American cheese, stout onions, dill pickles, little gem lettuce and special sauce on a brioche bun. The Impossible Burger debuts March 2 at the Bareburger outlet at 535 LaGuardia Place, NY, near NYU. Bareburger, which has 43 restaurants, is the first multi-unit chain to feature the Impossible Burger. "Our mission is to make delicious, nutritious and affordable food for everyone -- in a way that is sustainable and scalable," said Impossible Foods CEO and Founder Patrick O. 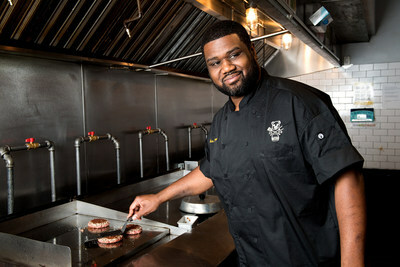 Brown, M.D., Ph.D. "Bareburger is a great partner for us because we're both growing fast. We can learn from each other and from our customers -- and I'm sure we'll have a lot of fun!" Customers can select Bareburger's Impossible Burger with Bareburger signature seasoning, American cheese, stout onions, dill pickles, little gem lettuce and special sauce on a brioche bun for $13.95. In addition, customers can create their own, customized Impossible Burger, selecting from any type of bun, sauce and toppings on the extensive menu. Similar to conventional ground beef from cows, Impossible Burger is a highly versatile ingredient: It can be cooked rare to well done, seasoned liberally or minimally; it can be the medium-well patty in a classic, fast-food-style cheeseburger -- or the decadent centerpiece of a bistro burger topped with shiitake and grilled onions on a brioche. Chefs have served it in dishes such as spicy rice cakes, dumplings and tacos. Founded in 2009 in a vacant bakery in Astoria, New York, Bareburger has grown to 43 locations in five countries. Bareburger is a leader in America's "better burger" trend, emphasizing high-quality food in a casual environment. Bareburger, which serves beer and wine, is ranked one of the 10 most sustainable restaurants in America and a "breakout brand" by Restaurant News. Bareburger emphasizes delicious, sustainable ingredients without artificial flavors. Bareburger is a four-time winner of a prestigious Michelin Guide recommendation and has received multiple awards from the James Beard Foundation. "My first taste of the Impossible Burger was a surreal moment: a burger that was delicious, simple, clean and sustainable? I couldn't believe it," said Euripides Pelekanos, Bareburger CEO and Co-Founder. "I know this may sound cheesy, but I truly believe that serving the Impossible Burger at Bareburger will help make the world a better place." The Impossible Burger is the world's only burger that looks, handles, smells, cooks and tastes similar to ground beef from cows -- but it's made entirely from plants, with a much smaller environmental footprint than meat from animals. The Impossible Burger has no hormones, antibiotics, cholesterol or artificial flavors. The Impossible Burger uses 75% less water, generates 87% fewer greenhouse gases and requires 95% less land than conventional ground beef from cows. The Impossible Burger is also available in New York at the Michelin-starred restaurant PUBLIC and its sister bar, The Daily, and at meat-centric bistro Saxon + Parole. It's available in San Francisco at the acclaimed restaurants Jardinière and Cockscomb, and in Los Angeles at Crossroads Kitchen. Later this month, Impossible Foods will inaugurate its first large-scale manufacturing plant. The plant, in Oakland, Calif., will begin producing Impossible Burgers this summer. As the plant scales up production throughout the second half of 2017, the company will be able to supply Impossible Burgers to more and more restaurants. The company plans to launch Impossible Burgers at more fine-dining restaurants and multi-unit chains throughout the United States. After that, Impossible Foods plans to introduce Impossible Burgers in retail locations and in key regions internationally. The company is also developing additional plant-based meat and dairy products. Based in Redwood City, California, Impossible Foods makes delicious, nutritious meat and dairy products directly from plants -- with a much smaller environmental footprint than those produced from from animals. Impossible Foods is a private company with financial backing from Khosla Ventures, Bill Gates, Google Ventures, Horizons Ventures, UBS, Viking Global Investors and others. The company was founded in 2011 by Patrick O. Brown, M.D., Ph.D., formerly a biochemistry professor and Howard Hughes Medical Institute investigator at Stanford University.